CHICAGO – The legend of a 1930s country hermit – part folk tale, part exaggeration and some truth – comes to life through director Aaron Schneider and the great Robert Duvall in the new film “Get Low.” Also featuring Bill Murray and Sissy Spacek, this character driven drama is a pastiche of secrets, regrets and redemption. Robert Duvall is Felix Bush, a reclusive hermit in a log cabin amidst the emerging 20th Century of the 1930s. He causes a stir one day when he rides into the main town and wants to pay for his funeral. Funeral director Frank Quinn (Bill Murray) is willing to accommodate the old man, including his unusual request to conduct the funeral while he still lives. As word spreads of the odd arrangement, people start to emerge from Bush’s past, including an old love named Mattie Darrow (Sissy Spacek). The mystery of the old man starts to surface. Director Aaron Schneider worked on getting the script for Get Low to the screen for several years after his first short, “Two Soldiers,” won Best Live Action Short Film at the 2003 Academy Awards. Schneider began his career as a cinematographer, collecting an impressive roster of TV and film credits, including some second unit work on “Titanic.” His Oscar win includes a connection to the host of the awards that year, Billy Crystal. HollywoodChicago.com: This film is set in a certain time and a certain place. What characteristics did you want to emphasize in the screenplay or the production itself that would best exemplify that certain time and place? Aaron Schneider: We did a location scouting a full three or four years before we got the funds together for the film. We knew the biggest challenge in the budget would be this little line in the script, ‘Felix Bush goes through town on his mule through Main Street.’ We also knew that quick little sequence would be the toughest location to find and the most expensive thing to do, and would define our little hamlet. It’s easy to find a barn, a church and a house for the period, those are everywhere, but to find a stretch of Main Street that is shootable, without telephone poles or McDonald’s, is a challenge. We went all over the Southeast, through the Carolinas, Tennessee and Louisiana. Our last stop was Georgia, in a little town called Crawfordsville, and it was a blast from the past. It had been untouched, down to the door hardware and brick facades. And because the downturn economy had hit the town, there were empty rooms in the storefronts. Not only was the street great, but we could build a set in the shop fronts, to connect the period from the outside to the inside. HC: There are elements of the technological age permeating Felix’s hermit man lifestyle (the cars, photography, the microphones etc. ), and you did linger on their invasive qualities. How do you think those changes affects Felix’s story? AS: I wasn’t consciously aware of the technology, but it was a way to show how brand new it all was to Felix. There was an irony and sense of humor in that. We always knew the scene where he was on the radio would be fun, because he is the most unlikely talk show guest you can imagine. HC: What type of authenticity were you attempting to achieve in telling a story set in the 1930s? Did you get deep into how the characters would behave at that time in American culture or were you just allowing the universal themes to drive the atmosphere? AS: Besides the physical set, the period authenticity was in the writing. We had two writers, Chris Provenzano and Charlie Mitchell. Charlie was the last to go over the screenplay, and he put a lot of the period detail in it, like behavior and the way people were. The tempo of their conversation, the sense of humor, all that is period detail, as much as the old fan in the background. HC: This story is based on a true legend in Americana. What elements of the true story did you most want to expose when you were working with the screenwriters and production team, and what scene in the film do you think is closest to the true events? HC: You have two Oscar winners, a legendary comedian and several veteran character actors to take on in a feature debut. Can you give a few examples of what you brought to the plate for them and their characters in regard to guiding the film through your vision? AS: Before we even began, I’d like to think my biggest contribution was working with the writers in developing the screenplay. Everything begins and ends with the screenplay, not just in terms of the movie you end up making, but also in terms of attracting a cast. If a cast gets a hold of what they feel is a good screenplay, then you’ve already contributed something, you’ve created a piece of material that attracts wonderful actors. Everybody did the film because they loved the screenplay and they wanted to work with Bobby Duvall. I like to credit myself with helping to create the opportunity to give Bobby Duvall to do a lead role, and then it snowballed from there. HC: Sissy Spacek brings a certain style and vision to the character of Mattie. What do you think she emphasizes as an actor that makes her portrayals so distinct and her own? AS: Sissy has talked about this a little bit. She felt as though there is a lot of unrequited love in the movie. That’s what she latched onto. She was in love with Felix so many years ago and now here he is in his life again, but he is in love with someone else who is now gone. So there is an unrequited love between her and Felix. There is an unrequited love between Felix and the woman he lost. 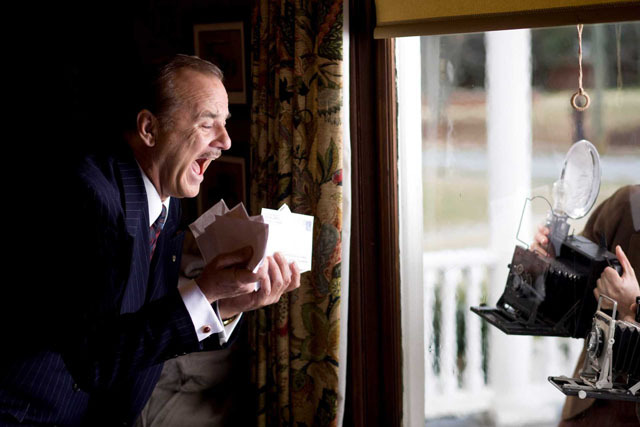 There is even a few colors between Bill Murray’s character and Sissy’s character. Everybody is a little empty, reaching out for something they can’t have. They all come together in their loneliness, in a way. Sissy’s character has a tremendous journey. She goes from being widow, trying to figure out how to live the rest of her life peacefully, to falling in love again. And discovering a 40 year old past that she didn’t know she had, this big window flying open. As powerful as Duvall’s character is at the end I’m also proud of Sissy’s performance as in she’s hearing this all for the first time. A whole new life story is being told to her that she never thought she had. So she’s dealing with loss again, 40 years of rug being pulled from beneath her. I thought she did a marvelous job. HC: This is a film about redemption, not only for Felix Bush, but many of the other characters. Whose character’s life, besides Felix, do you think changes the most by the end of the movie and why? HC: What do you think of Bill Murray’s evolution as a actor? After coming from a comic base to a more tragi-comic journey in the last ten years. How do you feel that the role in your film is part of this evolution? AS: I’m pretty much the biggest Bill Murray fan in the world. I grew up watching him on ‘Saturday Night Live’ and all his film classics through the 1980s. And then ‘Rushmore’ came along, which I think is one of the great film performances of all time. I can’t think of any other actor in the world with the ability to make you empathize, laugh and cry at the same time. Everywhere he goes in real life, people love him, and the same goes for his film characters. It’s about warmth. If you take a really warm actor, and put him in a despicable role, there is a joy in that. Murray’s character says and does some pretty bad things in Get Low, but you’re always smiling as he does it, because Bill Murray the actor is so warm. HC: Even though this film is set in America’s past, how do you think it speaks to contemporary America and what message does it give us? I was thinking about that and I thought wow. I can think of a lot of things that happened to me in life that effect the way I live my life now. So even though we’re not hermits and we’re not living in our own self-impose physical jail, we are in it in subtle and psychological ways. Everybody has got an experience or tragedy or a mistake that sits on our shoulder and keeps us from living. And maybe that’s what life is about, getting those monkeys off your back. And that’s really what Get Low is, that’s really what Get Low means. HC: In the production notes, Robert Duvall comments that the script reminded him of Horton Foote and his film debut in ‘To Kill a Mockingbird.’ What similarities do you see between Felix Bush and Boo Radley in Duvall’s approach? AS: Well…imposing, isolated, mysterious, unknowable. But ultimately sympathetic. HC: Five years separated your Oscar winning short ‘Two Soldiers’ and Get Low. Was it for lack of the right project for you that delayed your feature debut or were there other circumstances regarding timing that caused the delay? AS: It’s not an uncommon story to hear people trying to get quality drama, independent films off the ground. You hear things like ‘took forever,’ ‘five years,’ ‘eight years,’ ‘ten years.’ But I did make a choice after the Oscar and the opportunity it gave me to meet people and look at projects. I really wanted to make sure that my first film would be the right movie to make. Not from a career standpoint, but it’s hard for me to make a movie I don’t love. It’s not like I want to ‘date’ a movie, I want to ‘marry’ it. HC: What was the most surreal thing that happened during your Oscar moment or part of the whole events surrounding that ceremony? AS: I was an engineering student. And I was two years into it when I made the decision to go to film school. And it was based on the advice I got from Billy Crystal. I was struggling on how boring engineering was, and I was on a family vacation in Florida. Billy Crystal was down there by coincidence with his family. I always dug special effects. I wanted to film the Millennium Falcon, I wanted to build the model for the Millennium Falcon and shoot it against green screen. My Mom said, ‘why don’t you ask Billy Crystal how to get into special effects.’ So I went over and introduced myself, and he was really nice. The long and the short of it was he recommended film school. Special effects, he said, are more of a trade than are a career or degree. Go get a bachelor of arts in film production, he said, and you’ll be exposed to the whole thing and maybe you’ll find a niche. And sure enough, he was right. I gravitated immediately to cinematography, because it was this wonderful blend of the science of light, lenses and emulsion with the art of mood and storytelling. It’s like engineering and painting. I then graduated and started building a reel and shooting everything I could, and I came up through music videos and commercials and eventually in the late 1990s, TV and some features film. I then made the decision I wanted to make my own movies, that’s what the short film was, an attempt to shift my career and show people I could do it. But the most surreal thing about the Oscars was it did not dawn on me until they called our name and I went up on stage that Billy Crystal was the host that evening. I hadn’t connected it. And as I walked up the steps and I saw him standing there I thought, ‘oh my god.’ I had some names prepared for the speech, but I stepped up to the mike and said, ‘Billy, I bet you don’t remember recommending film school to me. Thank you.’ It was life coming full circle. Submitted by Anonymous (not verified) on August 9, 2010 - 4:36pm.